Francesca von Habsburg, Founder and Executive Producer of Thyssen-Bornemisza Art Contemporary (TBA21): "It is more imperative than ever to share the achievements of science and research openly in order to define a holistic approach for humanity in dealing with climate change." 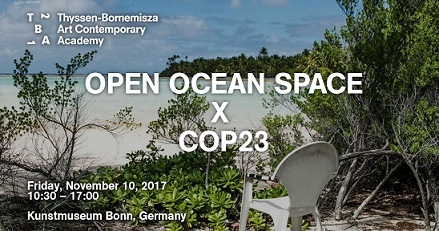 In aid of the ocean and its protection, "Open Ocean Space X COP23" will share through examples how interdisciplinary knowledge exchange can lead to new approaches that are locally responsive, collaborative and innovative. Francesca von Habsburg will kick off the program, giving insights into her own history of environmental protection and how art can contribute to the general recognition of the burden the ocean is under. Subsequently, performances, conversations and films will be presented on the subject "Creating a movement from the individual to the organisation". This morning session will examine how exemplary commitment to protecting the ocean can influence global movements, and how global campaigns could better consider local circumstances. The speakers include social entrepreneur and founder of Loving Islands Litia Kirwin (Fiji), Paramount Chief of the Totoya Islands, Lau Province, Roko Sau (Fiji), chairperson of the Alligator Head Foundation Dee Kyne and the youth ambassador of the Alligator Head Foundation Wayne J. The afternoon session will open up a debate on the topic of: "Is conservation a new form of colonialism? "; making a critical investigation into the cultural impacts of conservation, especially on traditional communities. Speakers include the young climate activist Yugratna Srivastava, film artist Lisa Rave, co-founder and executive director, ARTPORT_making waves Anne-Marie Melster and president of The Ocean Foundation Mark Spalding. The program will conclude with a screening of "The Impossibility Of An Island," a selection of artist films that show the cause, extent and impact of planetary destruction. Curated by OLHO co-founder Vanina Saracino, the films highlight how, in particular, oil and water are considered as forces that physically, economically and socially connect as well as separate. The program has been developed in association with Anne-Marie Melster, ARTPORT_making waves, and is an Official Climate Partner to UNFCCC, the Fijian Presidency of COP23, the German Federal Ministry for the Environment, Nature Conservation, Building and Nuclear Safety and the City of Bonn. Co-founded by Francesca von Habsburg and Markus Reymann, TBA21-Academy leads artists, scientists, and thought-leaders on expeditions of collaborative discovery. Its mission is to foster a deeper understanding of our ocean through the lens of art and to engender creative solutions to its most pressing issues. Established in 2011, the nonprofit's program is informed by a belief in the power of exchange between disciplines and in the ability of the arts as a vessel for communication, change, and action.